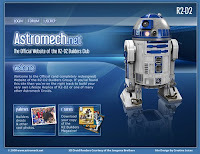 Yesterday marked the 2 year anniversary of the relaunch of the official website of the R2 Builders Club: Astromech.net. The R2 Builders Club is unique among the Star Wars fan community in that so many of its resources are found in one place. No where else can you find such a great repository for knowledge about such an intricate topic. If you aren't reading and participating at Astromech.net, you are missing more than you are seeing!